While developing, sometimes I had to group view rows results by two or three in a row and wrap them into some divs as it shown on the screenshot. In order to make this happen I had to make some coding into views-view-unformatted.tpl.php template. Finally, I decided to write a module which would handle this functionality as simple as possible. I have also contributed this module for the Drupal community on drupal.org. 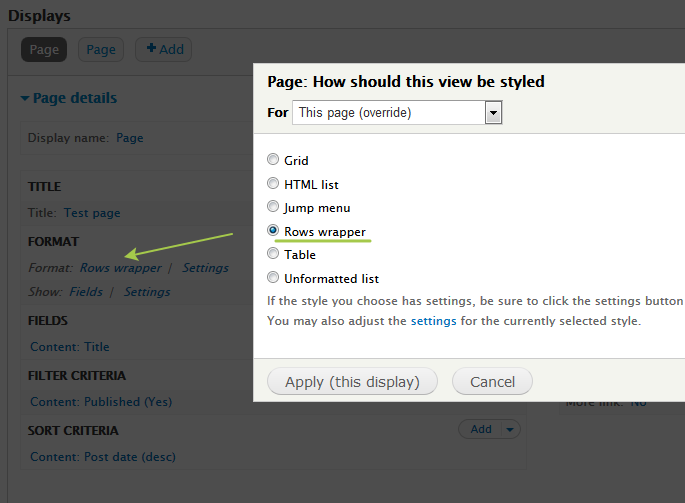 The module defines “Rows wrapper” views style plugin which is available for selection at “Format” section on the view Displays page. This module has the interface under settings page, where we can select number of rows and div or span wrapper element with its class/id attributes. In this tutorial I'm going to show how it was done. For the name of the module I will use view_rows_wrapper name. The module will implement two views hooks hook_views_api(), hook_views_plugins() and template_preprocess_hook() for the output render. description = The view style plugin, that combines a user defined number of rows into sets, wrapped by chosen elements and attributes. Then create views_rows_wrapper.views.inc file where hook_views_plugins() hook will be implemented. This hook returns array with parameters of the new view style plugin. Make sure you are using the proper naming for the handler class, the name pattern should be set as [modulename]_plugin_style_[stylename]. The file name should be the same as our style handler name + .inc extension. It was actually listed as an include file in our .info file. 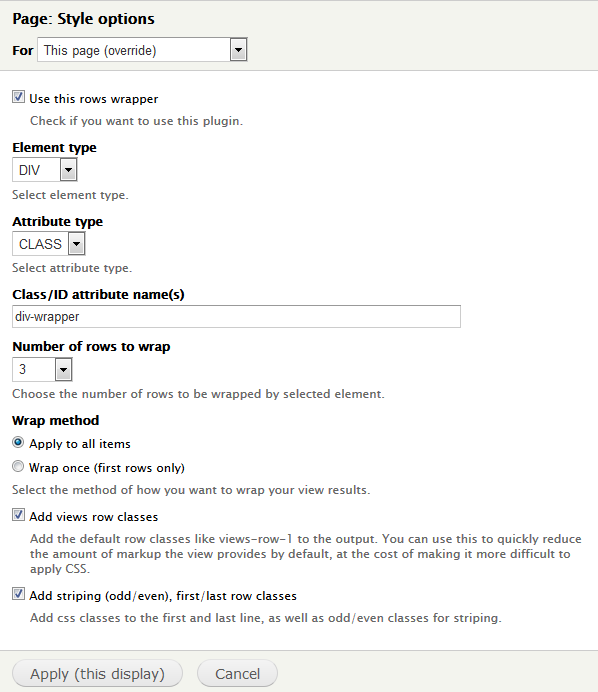 Inside that file will will extend the views_plugin_style class and implement settings page for our view style. The options_form returns the array with the form fields which we will use for the plugin. * Defines a style plugin that wraps rows inside view. All the fields values will be available at our module under template_preprocess_hook() as $options['field_machine_name']. Create views_rows_wrapper module file with the logic of our wrapper. * Implements hook_preprocess_HOOK() for theme_views_rows_wrapper(). We also need to add style template file. Note, that rows_wrapped key value into into $vars array on the output will become $rows_wrapped variable in our style template. * Template to display a views wrapped rows. Download this module from drupal.org.